Dear Applicants, do you want to apply for CGPSC Recruitment 2019? If yes then here is a good opportunity for you. Chhattisgarh Public Service Commission has issued notification for 117 Librarian & Sports Officer Posts. Online registration for CGPSC Sports Officer Jobs 2019 is going to start from 05.04.2019. Participants may submit their forms till last date i.e. 04.05.2019. Applicants who have completed their Post Graduation are eligible to apply for Chhattisgarh PSC Vacancy 2019. For more details, candidates must read the given article carefully. 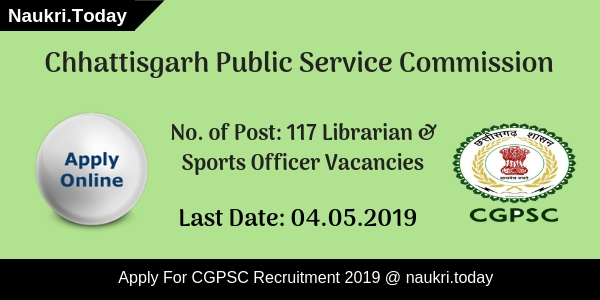 Fresh Update as on 28.03.2019: Chhattisgarh PSC is going to recruit applicants on 117 Librarian & Sports Officer Vacancies. The Online Registration will be closed on 04.05.2019. Candidates may check here eligibility criteria, age, and other details from here. Aspirants may apply online for CGPSC Recruitment 2019 from direct linsk given here. What is the Required Eligibility Criteria For CGPSC Recruitment 2018-19 – State Service Examination? What is the Required Eligibility Criteria for CGPSC Recruitment 2018 – CG Forest Service Examination ? How Much Pay Scale will pay For CGPSC Vacancies ? How To Fill Online Form For CGPSC Recruitment 2018 – Chhattisgarh PSC Vacancies ? For Librarian Post: Candidate must have completed Post Graduation in Library Science/ Documentation Science/ Information Science. For Sports Officer Post: Master’s Degree in Physical Education/ Sports Science. What Certificates To Be Send For Document Verification Of CGPSC Recruitment 2019? What Is The Size For Uploading Signature & Photo In CGPSC Sports Officer Vacancy Application Form? Candidates must upload photograph in JPG/ JPEG/ PNG format in 20-60 KB size. Signature should not have size more than 10-30 KB. Conclusion: Chhattisgarh Public Service Commission is inviting applications for 117 Librarian & Sports Officer Post. Participants can apply online for CGPSC Recruitment 2019. Participants may submit their application form for CGPSC Sports Officer Jobs till 04.05.2019. 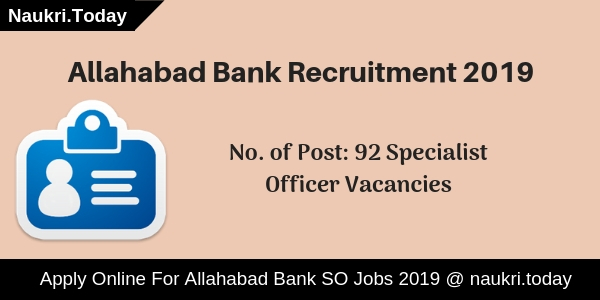 Are you seeking for CGPSC Recruitment 2019? If yes, there is good news for you. Chhattisgarh Public Service Commission has issued notification for appointing candidates on 1384 Assistant Professor Vacancies. Interested applicants should check here qualification, age and much more details from here. Eligible aspirants may fill up their application form before the last date i.e 05th March 2019. The Online Registration will be begun form 04 February 2019. Here we provided you links to apply for CGPSC Assistant Professor Vacancy 2019. Candidates should read below article for furthermore information regarding CGPSC Jobs 2019. Applicants who are going to apply for Assistant Professor Posts should check here eligibility criteria. Candidates can register themselves before the last date for CGPSC Vacancy 2019. Aspirants should fill up their application form carefully otherwise, their form will be rejected. Here we provided you qualification, age and application fee details for CGPSC Jobs 2019. Candidates should have Masters Degree in relevant subjects given above with minimum 55 % Marks from any recognized University and Institution of government. Participants may also be required NET/SLET/SET Exam Passed form UGC/ CSIR for CGPSC Recruitment 2019. Aspirants who have Ph.D./ MPhill are not allowed to participate in NET/SLET/ SET Examination. For further more details applicants may refer to the official CGPSC notification 2019. The Department has set 21 years as a minimum age for CGPSC Assistant Professor Recruitment 2019. And the maximum is 30 years as on 01.01.2019 for Assistant Professor posts. The Department has set 35 years as the maximum age for General Category Candidates of Chhattisgarh State only. Upper Age relaxation for reserved category candidates is applicable as per government rule for CGPSC Vacancy 2019. Applicants may download CGPSC Assistant Professor Notification 2019 form links given here. General Category candidates have to pay Rs. 400/- as an application fee for CGPSC Recruitment 2019. Applicants who belong to SC/ST/PH Category will pay Rs. 300/- for an examination fee for CGPSC Assistant Professor Jobs 2019. Participants can submit their application fee through Online mode only. Candidates may use their Credit Card, Debit Card, & Net banking for the payment of an application fee for CGPSC Vacancy 2019. The Department does not mention particular criteria of selection for CGPSC Assistant Professor Jobs 2019. CGPSC department will conduct either written examination or Interview for appointing candidates on assistant professor posts. The Department has rights either it organized written examination or not. For furthermore information aspirants may refer to the official CGPSC Notification 2019. Chhattisgarh PSC Department will pay a good amount of salary to the selected candidates for CGPSC Assistant Professor vacancy 2019. Selected applicants will get Rs. 15,600/- to Rs. 39,100/- for CGPSC Bharti 2019. The Department may also pay Grad pay of Rs. 6000/- to the selection aspirants on Assistant Professor Posts. Candidates may refer to the official notification for further more details regarding CGPSC Vacancy 2019. Participants should collect eligibility criteria details before applying for CGPSC Recruitment 2019. The Registration Process for assistant professor posts will be started form 04.02.2019. Interested and Eligible candidates may fill up their application form according to an instruction given here. Log on to the Official Website of Chhattisgarh Public Service Commission i.e psc.cg.gov.in. After that search for CGPSC Assistant Professor Recruitment section at the Homepage. Click on The CGPSC Advt. PDF link and read the complete notification carefully. Check Eligibility Criteria, Age and other details for it. Eligible aspirants may fill up their CGPSC Application Form 2019 from here. After that submit your application fee through online mode. Recheck your application form before submitting it. Take print of an application form for feature use. Conclusion: Chhattisgarh Public Service Commission has released notification for 1384 Assistant Professor vacancies. Applicants should check here eligibility criteria before applying for CGPSC Recruitment 2019. For furthermore information aspirants may refer to the above article. Chhattisgarh Public Service Commission has released State Service Examination Notification of total 160 Posts. There are Accounting Officer, Commercial tax Inspector & Various Other Posts. Applicants who are searching Jobs in Chhattisgarh State can fill online form for CGPSC Recruitment 2018 from here. You can fill CGPSC Jobs online from here on or before the last date 05th January 2019. CGPSC Chhattisgarh is inviting online form for filling up 160 Commercial Tax Inspector, Accounting Officer, & Other Vacancies. Online registration for CGPSC Vacancies will be started from 07.12.2018. Candidates who are going to fill online form should check post wise required Eligibility Criteria for Chhattisgarh PSC Recruitment from here. Our team is providing full information like Education, Age & Other for CG State Service Exam in the below article. Applicants, here we describe full details about Eligibility Criteria, pay scale & selection criteria for CGPSC Jobs. Aspirants who are going to fill online form can check post wise required details from here by reading the below section. Also, check this information from Official CGPSC State Service Exam Notification. Candidates must have done Graduation Degree or higher qualification from any recognized University for CGPSC Vacancies. Post wise required education qualification you can check from official notification. Minimum age of the appliers for CGPSC Recruitment 2018 should be 21 years & upper age must be 30 years. Participants who applied for Deputy Superintendent of Police Posts, their maximum age is 28 years. Relaxation in age criteria for Chhattisgarh PSC Recruitment 2018 is applicable up to 05 years for SC/ST Category & 03 years for OBC Category candidates. Candidates of SC/ST/PWD category of Chhattisgarh state need to pay Rs. 300/- as application fee for CGPSC Recruitment 2018. Other category applicants must paid Rs. 400/- for Chhattisgarh PSC Vacancies 2018. Fees must be deposit through online mode. Applicants which will get selected for CGPSC State Services Vacancies. will paid good salary as per organization rules & regulation. Check post wise monthly salary from official notification. Candidates for CGPSC Vacancies will be selected on the basis of written examination and Interview. Exam will be divided in to two parts. candidates should get minimum passing marks for qualifying the exam. Final merit list will prepare on the basis of marks obtain in a written examination. Applicants log on to the official website www.psc.cg.gov.in. Now click on Advertisement Section & Click on CG State Service Exam Notification. Then upload your recent passport size photo & signature in the form properly. Recheck all filled details filled in CGPSC Online form before submission. Take print out of Chhattisgarh PSC Vacancy Online form for future use. Conclusion : – CGPSC Recruitment 2018 for 160 Various Vacancies. Candidates can apply online form for CGPSC Vacancies on or before the last date, that is 05.01.2019. For more information read the official notification of Chhattisgarh PSC Vacancies. Dear Applicants, CGPSC has issued Chhattisgarh Forest Service Exam notification. There are total 59 Assistant Conservator of Forest & Forest Ranger Vacancies. Interested candidates on CGPSC Recruitment 2018 can fill online form here till the last date. Closing Date for submit CGPSC Forest Ranger Vacancies online form is 06th February 2018. For more information about CG Forest Service Exam Notification must read the below section. Chhattisgarh Public Service Commission has issued notification of 59 Forest Ranger & Other Posts. Submission of online form for CGPSC Vacancies has started from 08.01.2018. This is great job opportunity for all the candidates who are searching Jobs In Chhattisgarh State. Appliers can check post wise required Eligibility Criteria, Pay Scale & Other details for CGPSC Forest Ranger Vacancies from here, which is mention in given below article. Appliers can check post wise required eligibility criteria like education & Age Qualification from here for CGPSC Vacancies. In the below section we are also provide Chhattisgarh PSC Jobs Notification for more details. Candidates must have passed Higher Secondary with Physics/ Chemistry/ Bio as subject from any recognized Board. More information about education Qualification you can check from CGPSC Jobs Notification 2018. Upper age of the candidates for CGPSC Recruitment 2018 must be 30 years. relaxation in age is applicable only for reserved category candidates as per department norms , relaxation in only applicable for candidates of CG State. Forest Ranger : Candidates will paid Rs. 9,300/- to 34,800/- with GP Rs. 4,300/- per month for CGPSC Forest Ranger Jobs. 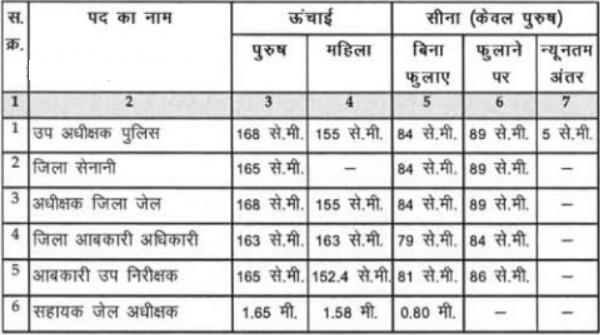 Candidates of SC/ST/OBC (NCL) Category of CG State must paid Rs. 300/- as application fees for CGPSC Vacancies. Other category applicants must paid Rs. 400/- for filling online form for Chhattisgarh PSC Jobs 2018. Fess must be deposited only through online mode & more information you can collect from official notification. Selection of the candidates for CGPSC Recruitment 2018 will made on the basis of written Examination & personal Interview. Final Merit list of Selected candidates will displayed on official website. Further information about Examination you can collect from official Chhattisgarh PSC Recruitment Notification. Interested candidates for CGPSC Vacancies 2018 can fill online form here till the last date. Follow the given steps which is helpful for filling online form for CGPSC Forest Ranger Recruitment 2018. Applying link is mention below. Firstly, candidates visit to the official website www.psc.cg.gov.in. Now click on Official CGPSC Jobs Notification link. Fill all required information in CG Forest Service Exam Online Form. Now deposit application fees & Recheck all filled details in online form. Click on submit CGPSC Online form. Conclusion : – CGPSC Recruitment 2018 For 59 Forest Ranger & Other Posts. Candidates can fill online form for Chhattisgarh Forest Ranger Recruitment on or before the last date 06.02.2018. Check more information about Chhattisgarh PSC Recruitment from here or from official Notification. Applicants who are waiting for the CGPSC Recruitment 2017 can now check the official notification from here. According to the advertisement Chhattisgarh Public Service Commission announced 69 vacancies for CGPSC Ayurveda Medical Officer and Physician Posts. The participants who are interested can apply form Online for CGPSC Vacancy 2017. Candidates can fill the application form online latest by 4th November 2017. Participants who want to apply for Chhattisgarh PSC Recruitment 2017 can check all the related details here. Chhattisgarh Public Service Commission is commonly known as CGPSC. Recently, the department has released a notification for 69 Ayurveda Medical officer and Physician Posts. The applicants who are interested in CGPSC Recruitment 2017 can apply Online from here. Candidates can also check the details like Eligibility Criteria, Pay Scale, Selection Process, Steps to fil Online application form for Chhattisgarh PSC Vacancy 2017. You can also check the official links given in the end to download CGPSC Ayurveda Medical Officer Jobs notification pdf and direct links to apply Online. Candidates who were searching for Ayurveda Medical Officer Vacancy can now apply. The participants can fill the application form as the registration process is still going on from 6th October 2017. Applicants can check the official links mentioned in the below coming article. The applicant who will be applying for CGPSC Recruitment 2017 should hold a Graduation degree from a recognized institution by Indian Medical Central Council. Candidates who are interested in Ayurveda Medical Officer Jobs can now download the official notification from the links mentioned below. The applicants who will be applying for Chhattisgarh PSC Vacancy should be a minimum of 22 years old and maximum 30 years old. Participants who are applying for CGPSC Ayurveda Medical Officer Recruitment need to pay application fee of Rs. 400/- for General Category. The applicants belonging to the remaining category have to pay Rs. 300/- as registrations fee. Candidates who will be selected for CGPSC Vacancy will have salary of Rs. 56,100/- . The applicants can refer the official links for notification pdf for Chhattisgarh Public Service Commission Jobs given below the article. The participants who will be appearing for CGPSC Recruitment 2017 have to prepare for Online Examination and Interview. The applicants will have Written exam for 300 marks and Interview will consist 30 marks. Participants who want to apply for CGPSC Ayurveda Medical Officer Recruitment can now apply Online from here. The applicants can fill the application form for CGPSC Vacancy latest by 4th September 2017. Candidates can check the below mentioned simple steps to fill the application form for CGPSC Jobs. You can also check the official links given below in the article to Download the notification pdf and apply online link for CGPSC Physician Recruitment 2017. Log on to the official website i.e. psc.cg.gov.in. Select the “CGPSC Ayurveda Medical Officer Recruitment 2017” notification. Now, open the notification and read it completely. Fill all the details correctly and upload your scanned photograph and Signature. Conclusion: CGPSC Recruitment 2017 – 18 notification is published on its official website. Candidates who are interested can apply for 69 CGPSC Ayurveda Medical Officer Vacancy. The last date to submit application form for Chhattisgarh PSC Jobs is 4th September 2017.